It’s almost a truism of media’s digital age: For all the ways in which newspapers have been battered by the shift away from print, the front page can still play a unique and remarkable role. In times of tragedy and crisis, a well-conceived front can focus a community’s grief and seek to represent a shared response—and, in a sign of the times, become widely shared on social media in the process. 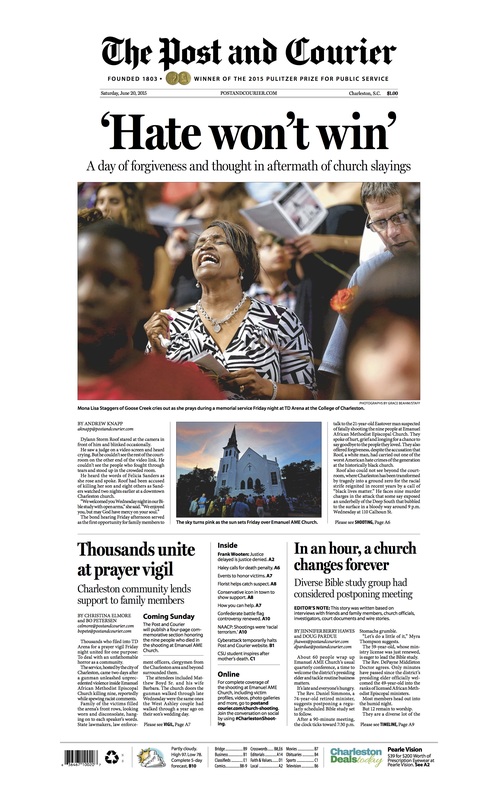 That’s what has happened over the past week in the wake of the racist massacre at a black church in Charleston, South Carolina, where The Post and Courier has produced a series of sensitive, visually powerful front pages that emphasize mourning and resilience. The images have been shared by thousands of people across the internet, and drawn a grateful response from readers on Facebook. 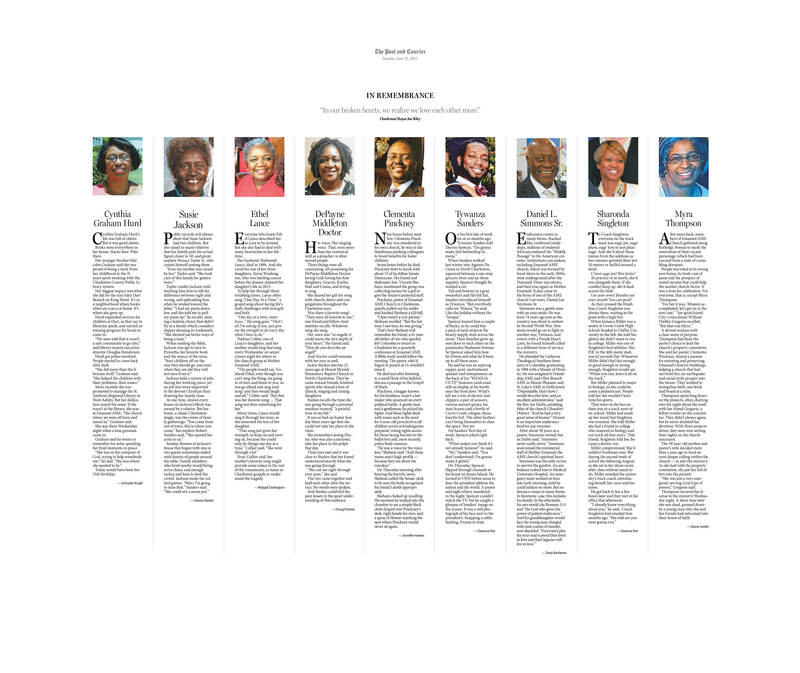 The most impressive was the Sunday front, a spare lay-out with a picture of nine palmetto roses, sometimes called sweetgrass roses, along with the names and a few details about each of the victims. The design promptly drew appreciation from national observers. But in South Carolina, those aren’t just any flowers. He credited Chad Dunbar, the paper’s design desk chief, with coming up with the sweetgrass roses. Often sold by street vendors, the roses are a sort of modern tourist-economy variation on sweetgrass baskets, which have a rich and well documented history in South Carolina. Slaves brought the technique used to make the baskets from Africa, and for generations, black residents of the state’s Low Country sold the baskets in roadside stands outside of Charleston. The baskets, originally made of bulrushes, are now a combination of sweetgrass, palmetto, and pine straw. Today, it’s not uncommon to see the baskets and roses for sale alongside each other in downtown Charleston. The rose front was actually part of a wrap cover; inside, the paper ran remembrances of each of the victims. 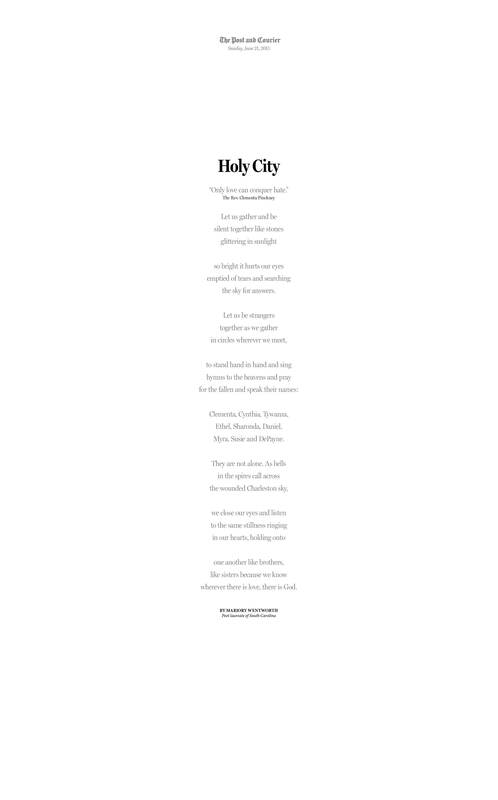 And it devoted the back page to a poem the editors asked South Carolina’s poet laureate, Marjory Wentworth, to compose about the shooting. 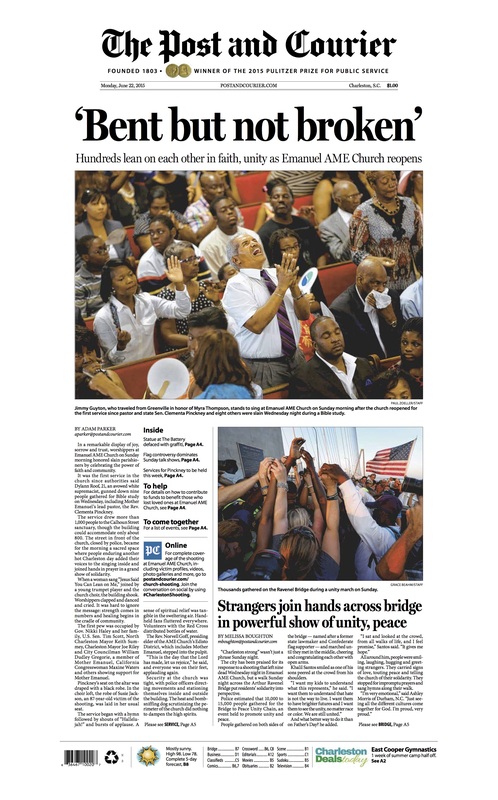 Roof’s image isn’t on the second Sunday cover, either, where the lead story is about the planned church service. In fact, The Post and Courier has yet to run a picture of the suspect on the front page. That’s a conscious decision, Pugh said, and one that has come in for praise–as has the paper’s broader coverage of the story. “We felt, in our community, people didn’t want to see this guy’s face in every news rack as they walked down the street,” he said. Tia Leanne Jones Those sweetgrass roses, so perfect. I got a little choked up as soon as I realized what they were. Good job ya’ll, now that I’ve seen it I can’t think of a better tribute. Obviously, the print covers are just one element of the coverage. 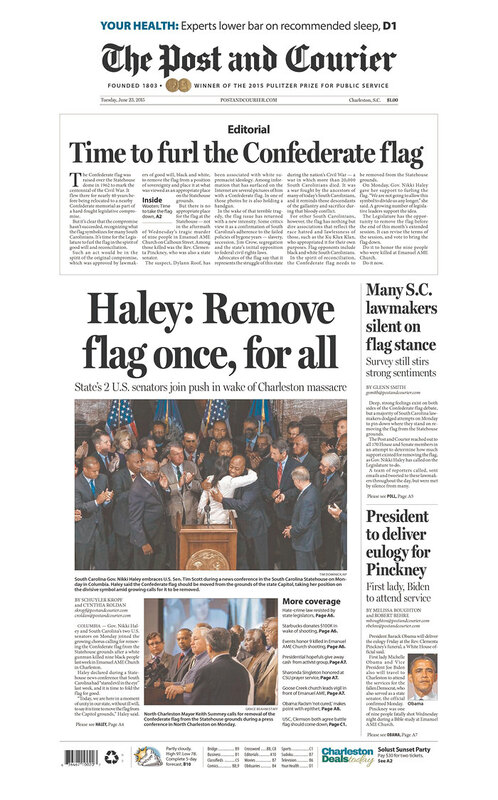 And as the days wear on and the national media goes home, the paper will need other ways to express and explain the news, especially as Charleston settles into the long process of trying the shooter. 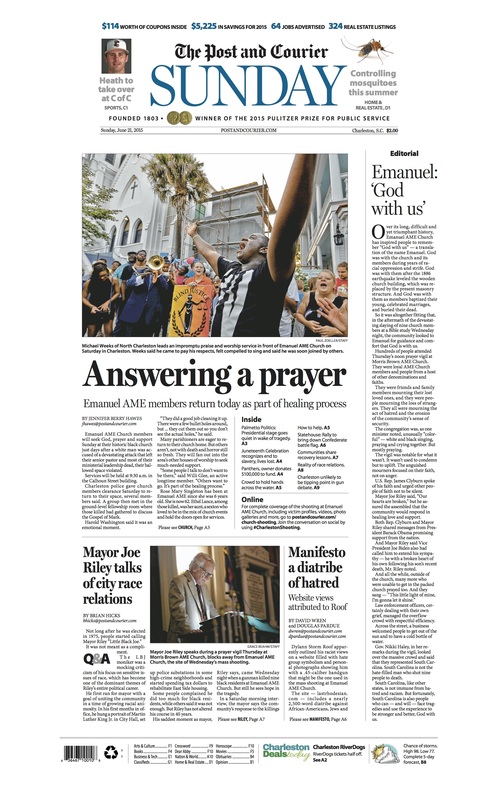 But in these first few days, The Post and Courier did an admirable job of reflecting its readers’ pain in stark, visually compelling—and yes, dignified—ways.